​Disease Including Cancer & Alzheimers...? Overwhelmed By The Information On Health, Fitness, Diet and Disease? 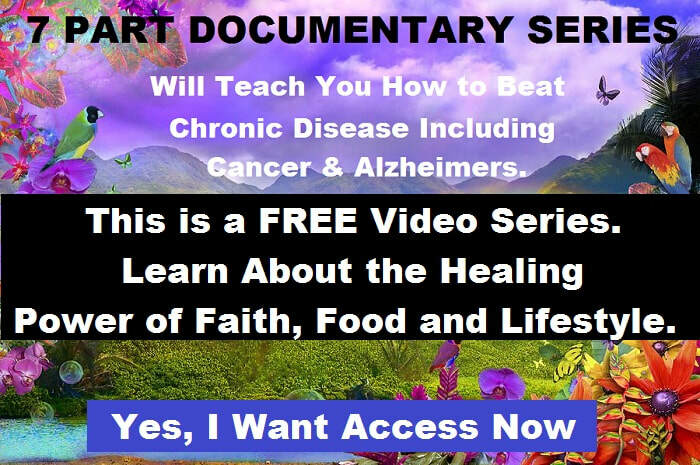 Bible Health Secrets to help you rise above the noise and learn the truth about the healing power of faith, food and lifestyle, as revealed in the inspired Word of God, to combat chronic disease and alleviate suffering. It’s our deepest desire to empower you through knowledge in the scriptures and inspire you with truth through shared stories which restore hope and enable you to make the healthy decisions you need to make for you and your loved ones each day. We hope this series will also, by the grace and power of God, empower you to be a positive influence; to inspire health of mind, body and soul in your communities. The Bible - Most Christians use it as a book to teach us how to treat others, how to conduct church, how to pray, but almost never do you they use it to teach you how to eat. Even with a disease like cancer, it’s been proven that over 90% of all cancers are caused by LIFESTYLE CHOICES, not genetic factors. There are a couple of Christian denominations that are following what the bible teaches in regards to health, and the results have been mind blowing. With better quality of life than the average American. So what are they doing to get these results? What are they avoiding? The Bible has the Secrets, and we are about to reveal them in this 7 Part Documentary Series starting August 14th. Register, so you can keep an eye on your email to receive episode updates. Please make sure to share this with your family and friends!